An unbeatable, pocket-sized guide to Athens, packed with insider tips and ideas, colour maps, top 10 lists, and a laminated pull-out map - all designed to help you see the very best of Athens. Discover ancient treasures at the National Archeological Museum, visit the Acropolis's breathtaking temples, wander Filopappos Hill's pine-covered slopes, or marvel at the Temple of Olympian Zeus. From the Top 10 archaeological sites to the Top 10 city strolls - discover the best of Athens with this easy-to-use travel guide. Staying for longer as part of a bigger trip around Greece? 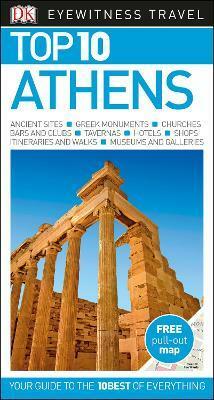 Try our DK Eyewitness Travel Guide Greece, Athens and the Mainland.